Bags under eyes surgery is intended to correct multiple lower eyelid problems like lack of firmness, excessive eye bag removal, removing dark circles under eyes and crow’s feet wrinkles if combined with additional cosmetic procedures. Like any surgical intervention, bags under eyes surgery has specific pros and cons that vary from patient to patient. Your plastic surgeon will address all these individual anatomical characteristics upon a careful pre-operative examination. Laser bags under eyes surgery has some strong advantages over traditional under eye bags surgery where an incision is placed right below the lower lid causing potential weaknesses of the surrounding muscles giving patients a hound dog look with scleral show. Laser bags under eyes surgery incision are placed on the inside of the eyelid using a laser technology that allows a surgeon to seal cut blood vessels resulting in less blood loss during surgery. 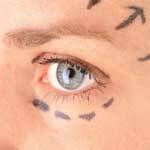 The recovery times are also much faster in laser lower blepharoplasty vs. traditional lower eye surgery. In addition to removing excess fat tissues, your surgeon can use laser resurfacing procedure to erase wrinkles and succeed in removing dark circles under eyes. Traditional under eye bags surgery poses some potential problems that might require revision surgeries due to lower eyelid malposition and scleral show. These under eye bags surgery complications result because eyelid laxity that is progressing with age is hard to predict in some patients. However, in some cases an open traditional bags under eyes surgery is unavoidable if a patient has excessive folds of under eyes skin that laser technology simply can not address. Non surgical eye bag removal is highly recommended for patients with mild forms of under eye bags that can be corrected with gel filler injections to even out the under eye area of application of natural under eye bag removal remedies. Check out our other articles on natural ways to reduce under eyes bags and remove dark circles under eyes.